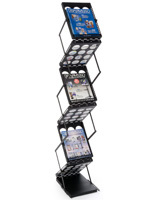 This portable literature counter is a 40” tall pop up display for trade shows. 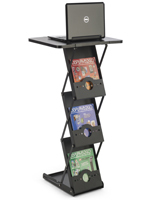 Set up the pre-assembled unit in seconds by pulling the stand upright and locking in place. 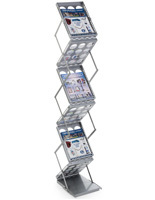 Have a ready-to-go exhibit counter for all of your trade show needs with the magazine rack that includes a vinyl carrying bag for easy and organized transport. 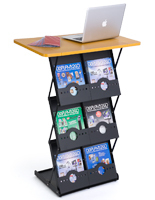 Display an abundance of periodicals on the 3 double wide shelves to promote company products and services. Use the 20” wide tabletop of the counter to showcase different samples or transform the stand into a work space for laptops and customer interaction. 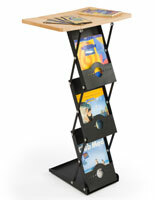 The pop up lectern brochure stand for exhibit use ships flat to save space and minimize shipping costs! Thanks for the great review, Dan! 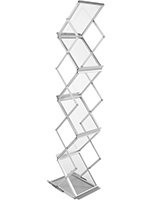 We're glad that this portable literature counter met your expectations. Please let us know if there's anything you feel we could improve — we always appreciate our customers' feedback. 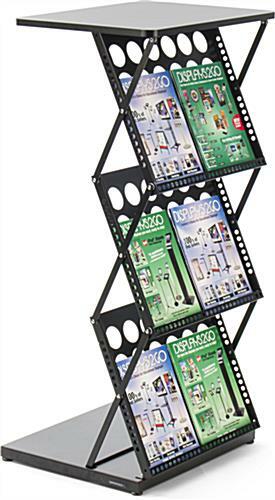 Great display stand. Set up in a few seconds. It feels solid and sturdy. 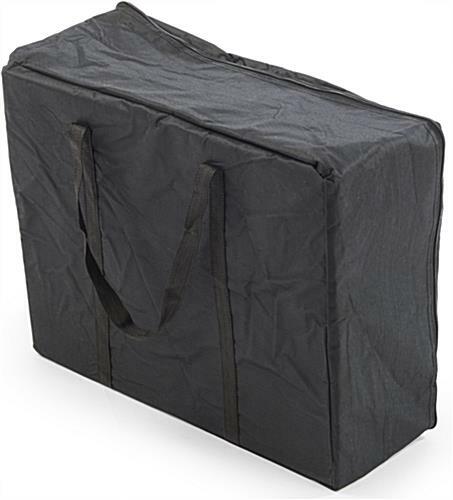 The case that it comes with is nice for carrying; however, I would not ship without packing around it. Very satisfied. Brent, thank you so much for sharing this with us! Your display looks amazing and we're so happy that you found our portable counter to be so high-quality and easy-to-use. We appreciate your feedback, and we hope you'll shop with us again soon! 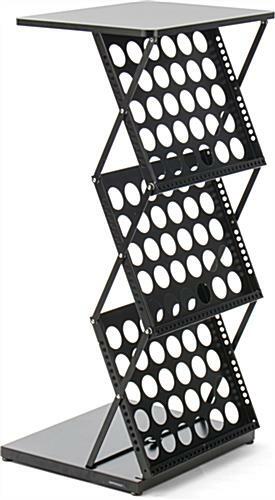 Easy to set-up/fold-down. 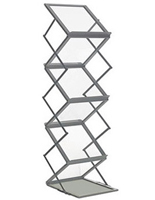 A bit heavy, but sturdy so no worries about it holding up over time or collapsing with a laptop or other equipment setting on top. Thanks for the great review, Kristy! We strive to provide high-quality products that are easy-to-use, and we're glad that our portable counter met your expectations. Please let us know if there's anything you feel we could improve — we always appreciate our customers' feedback! Thanks for the great review, Jessica! We're glad that this portable counter met your expectations and that you appreciated the included travel case. 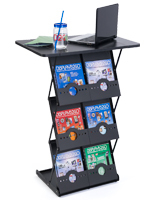 We hope you'll continue to turn to us for your trade show needs! LOOKS NICE NOW, TABLETOP FINISH NOT VERY DURABLE SO WE''LL SEE HOW LONG IT STAYS THAT WAY. STILL PRETTY GOOD VALUE FOR WHAT YOU GET. We appreciate your feedback tremendously, Brandon! 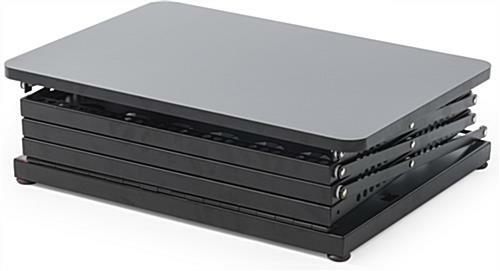 We will be sharing your thoughts about the tabletop with our product team for review. Thank you for taking the time to write us this feedback!